The health benefits of lettuce include lower cholesterol levels, prevention of cancer, protection of neurons, regular sleep, anxiety control, lower inflammation, and a constant supply of antioxidants. Lettuce, scientifically known as Lactuca sativa, was first cultivated by the Egyptians thousands of years ago. The Egyptians used the seeds to produce oil and also utilized the leaves of this useful vegetable. The plant also had cultural and religious significance in ancient Egypt, as it was considered to be sacred. Later, the Greeks and Romans also cultivated this crop. One can find instances of the plant being prescribed as a medicine for several diseases in the Unani medicine system as well. It was prescribed for bilious eructation, disturbed blood pressure, loss of appetite, insomnia, and was used as a tonic for the intestines and digestive system, and as a method to stop sexual urges. The dried latex of lettuce was prescribed for inducing sleep and was used as nasal drops, a sedative, an anti-spasmodic, and an anodyne. During the medieval times and into the beginning of modern times, lettuce spread from Europe to North America. During the 19th century, it spread to other parts of the world as well, particularly to Asia, South America, Africa, and Australia. Today, lettuce can be found in almost all parts of the world, from the Americas to Siberia. Lettuce contains moisture, energy, protein, fat, carbohydrates, dietary fiber, and sugars. The minerals and vitamins found in it include calcium, iron, magnesium, phosphorus, potassium, sodium, and zinc along with vitamins like thiamin, riboflavin, niacin, folate, vitamin B6, C, A, E, and vitamin K.
For thousands of years, this leaf has been cultivated as more than a vegetable. It was also thought to possess medicinal properties by ancient people. The health benefits that have been confirmed by modern scientific research include the following. Lettuce possesses anti-inflammatory properties that help in controlling inflammation. In experimental models, lettuce extracts have shown significant controlling power over inflammation induced by biocatalysts like lipoxygenase and carrageenan. Neurons are brain cells that form physical connections to make up memory. The death of neurons in particular connections or circuits can result in the loss of memory. In some extreme cases, significant neuronal death can result in the onset of diseases like Alzheimer’s. The extracts from lettuce showed considerable control of neuron cell death due to its role in glucose/serum deprivation (GSD). The research also mentioned that lettuce has the potential to be used in neuroprotection as a common remedy for neurodegenerative diseases. Lettuce can be beneficial in lowering high cholesterol levels that often lead to cardiovascular diseases and other dangerous conditions. High LDL cholesterol levels are harmful and can cause heart attack and stroke. A study was conducted on mice to test the impact of lettuce consumption on fat and cholesterol. The results indicated a significant reduction of cholesterol levels compared to mice that weren’t fed lettuce. Lipid peroxidation was observed in most cases, which was concluded to be responsible for this form of cholesterol control. One of the major traditional uses of lettuce in Unani medicine was as a sleep inducer. Research into the extracts of lettuce resulted in the isolation of a depressant chemical. This chemical, when administered in experimental animals, showed significant sedative effects. Decreased heart rate and ventricular contractions were also observed. This particular chemical acts by blocking the excitatory signal processes of muscular and neural tissues. Studies have shown that lettuce possesses antioxidants with significant free radical-scavenging capabilities. Antioxidants are a wide range of bio-chemicals mostly found in our diet; they are also very necessary for human health. Antioxidants act as barriers to free radicals, which are produced during cellular metabolism. These free radicals attack healthy tissues, cells, and the DNA inside them. They can often cause healthy cells to mutate into cancer cells. The result is the development of various diseases. Antioxidants, on the other hand, counteract these free radicals and neutralize them before the free radical attacks take place. The latex of lettuce possesses antimicrobial properties. Candida albicans and a number of other yeasts were completely deformed upon coming into contact with the latex from lettuce. Bio-chemicals that are considered to possess these antimicrobial properties are the terpenes and cardenolides, as well as enzymes like glucanases. The neurological properties of lettuce have long been suggested and exploited during ancient times and the Middle Ages in medical treaties such as the Unani system. Detailed research in recent times has led to the conclusion that lettuce possesses anxiolytic properties. When lab animals were given lettuce extracts, their locomotive activity was reduced, suggesting considerable anxiolysis. Lettuce leaf extracts can control certain types of cancer. 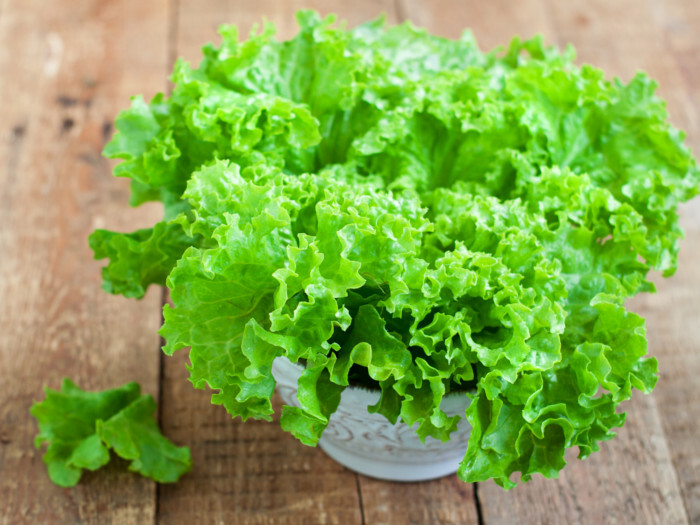 Research on human cancer cells, particularly leukaemia cells and breast cancer cells, were controlled to a significant extent after being treated with lettuce extracts. The experiments also suggested that the weight ratio of human lettuce consumption required to kill 50% of leukaemia cells would be 3 kg. A few recipes are given below that can be easily tried at home. 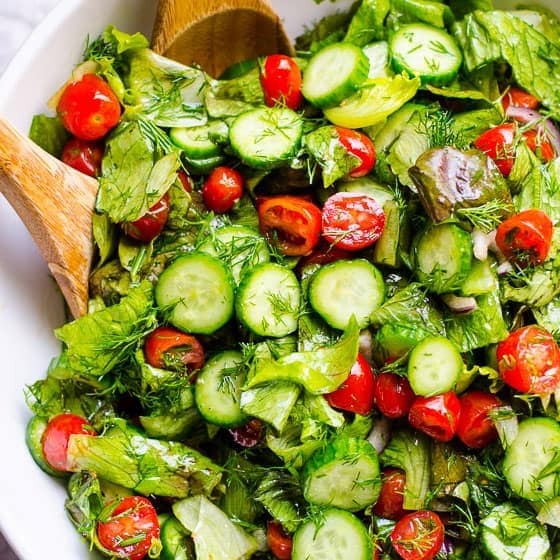 Vegetable Salad: Cut a tomato, cucumber, radish, carrot, red pepper, yellow pepper, and lettuce leaves. Add the cut vegetables to a bowl. Season with salt, pepper, a dash of olive oil, and lime juice. Corn Lettuce Salad: Boil one cup of corn and let it cool. Cut some lettuce, onion, and tomato, and put it in a bowl. Add the boiled corn to this mixture. Season the mixture with salt, pepper, olive oil, and lime juice. You can add other vegetables like boiled baby potatoes, mushroom, or peas, or even throw in some boiled chicken or fish. Word of Caution: Studies have shown that even lettuce can produce allergies, and the allergen proteins have been identified. Food allergies are the abnormal response of the immune system to certain types of food that the body recognizes as harmful. Food allergies that result in anaphylaxis are the worst kind and according to the Centre for Disease Control, they are on the rise. People who already suffer from food allergies are generally at risk when trying new foods. So, a word of caution is advised while eating lettuce for the first time. Try skin prick testing before eating it, just to be sure.